MaGPat is a project of glacier exploration in Argentina and Chile on the Hielo Patagonico Sur. The project is a collaboration among Spélé’Ice, La Venta Esplorazioni, National Museum of Natural History of Paris, the University of Milano Bicocca and the University of Milano. The project has scientific, documentary and educative porpouses. The expedition will be carried out from 23rd of March to 19th of April 2017 on Perito Moreno Glacier and Tyndall glacier. The days of departure. We (the people from Milano) take the flight from Linate to Rome to procced toward El calafate via Buenos Aires. In Rome we meet the people from La Venta and in Buenos Aires we join the French components. 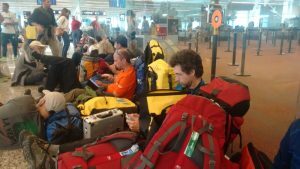 Here all the expedition partecipants at Buenos Aires airport waiting to board towards El Cafafate. The day of the departure to the Glacier. 5.15 am we leave our comfortable beds toward the harbor. 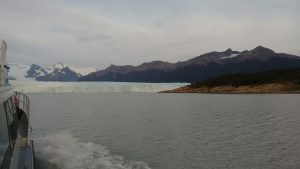 We cross the “Lago Argentino” and we reach the front of the Perito Moreno. We leave our luggage in excess to the base camp of the local guides and we start our trekking toward “Buscaini” Camp. 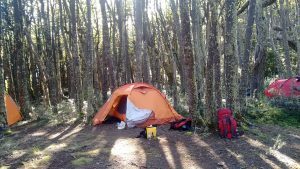 After 7 hours walking we organize our camp with tents. We need to bring to the “Buscaini” Camp the luggage that we left at glacier front. So we wake up early in the morning and at 8.00 our trip back starts. We take profit of this trip to collect samples from dated moraines for extracellular DNA analysis. We are back to “Buscaini” on 7 pm after more than 24 km of walking along the moraines and on the glacier, we are very tired but we have all we need for the field analysis and sampling. After the first exploration of the glacier surface we finally find the cryoconite holes. We collect four samples of cryoconite and we go back the camp to proceed with the DNA extraction. We organize (probably the southernmost, out of the Antarctica) microbiological laboratory in a tent. 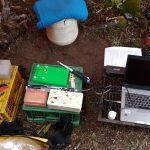 Today is the day of the on-field DNA sequencing. After the preparation of the DNA libraries, the nanopore MinIon sequencing starts at 1.00 PM. It works all day long and overnight: in the night we must wake up for checking that everything is going smoothly!